I am at that point in my life - and when it hits us is different for each of us - that I too often find myself comparing my life to that of those around me. Normally, this doesn't include things accumulated but life situations - jobs, families, skills accumulated, and the like. Yesterday I was with a group of friends for a cookout and though it was one of those days I didn't feel I had the energy after work to go anywhere, I mustered the energy (thank you Lord) and truly enjoyed an evening of good food and good fellowship. I spent some time looking over family pictures on the wall of my friend's home, weddings, grandkids, special times captured on film to be remembered and shared. I admired hand-crafted furniture that my friend has made and the incredibly clean and organized wood shop he had built for himself (I often find the people I admire to be neat and well organized, something I am not). He, like another pastor long ago had found solice in woodworking. I must admit to some moments of meloncholy as I reviewed the photos and souveniers of a life lived to the fullest in my friend's home, my singleness and the distance between family members becoming suddenly heavy on me. Also present was another couple whom I love dearly; they admitted to being devastated by the trouble of two of their kids who are just a little younger than I am. They are wonderful people who love the Lord with all of their hearts, yet their kids have chosen paths that are difficult and broken. I hurt for them. Their pain made mine suddenly vanish, further evidence that the best way to deal with your own burdens are to focus on those of others and how you can lighten them. Our self-worth can't come from our stuff. It can't come from the work that we do. We must deal with the issues Christ allows into our lives and do with them the best that we can. I was worth the life blood and death of Jesus Christ! I don't understand that, will never be able to fully grasp that love of the Father but I can't tell you how grateful I am for it. You are worth the life blood of Jesus Christ my friend! Luke12:24 tells us to "Consider the ravens: they do not sow or reap, they have no storeroom or barn; yet God feeds them. And how much more valuable you are than the birds!" I recently learned a bit of history that I had never heard of before...maybe those of you from our southern states are better informed on this subject. The War Between the States, The War of Northern Aggression, The Civil War...whatever you choose to call it, officially ended on June 2, 1865. General Lee had surrendered on April 9th of that year (what most consider the "end" of the war) and President of the Confederate States of America Jefferson Davis wasn't apprehended until May 10th. The final shot of the war wasn't fired until June 22, 1865. It wasn't a musket shot in Virginia or a cannon fired in the Carolinas; it was a CSA warship's cannon fired over the bow of a whaling ship closer to Russia's coast than ours (or what would become ours when Alaska became our 49th state many years later). The "Shenandoah" was a Confederate ship that never saw U.S. water, never put in at an American port of any kind. It slipped out of an English port(where it had been secretly purchased) under the eyes of the U.S. and British Navies as a merchant ship, was converted in route to a fighting ship (though lightly armed) and sailed around the world raiding 37 Yankee merchant and whaling ships, her reputation and speed causing much concern for the Yankee navy and businsessmen. Her head officers were Southern seamen who had previously served in the U.S. Navy. Most of her crew was made up of men from all over the world who had no personal stake in the war. Communication not being what it is now, they had no ship-to-shore radios or phones, no telegraph or email to be notified of the war's end. They picked up rumors of defeats, even Lee's surrender from passing ships or ships they raided (Lee's nepehew actually was serving on the ship), but it was assumed to be Yankee propaganda. In reality, most of their "success" came after the war had actually ended. They didn't learn the truth until late summer, they then packed up their weapons and ceased all aggression off the coast from San Fransisco, then sailed all the way back to England in hopes of avoiding being hung as pirates. Their actions had been perfectly acceptable in a time of war, but since the war had ended they might be treated under a different set of laws. (They killed no one, they only sunk or set fire to ships after all passengers and crew were removed). This crew kept fighting after their cause was lost. Rumors and unconfirmed reports of defeats were taken with a grain of salt and only served to strengthen their resolve to fulfill their mission. They did so while trying to stick to the letter of the law of the sea. Once back in England, the British were under tremendous pressure to confine them and return them to the U.S. authorities. They determined that in fact, under their (British) law, they could prosecute those on the crew who were British Citizens because it was illegal for them to partake in the war. Though a number of them were British citizens, to a man when the British Commander asked each man where they were from, they answered (unrehearsed) "I am a Southerner". He heard many accents. He saw many different skin tones. He no doubt heard different languages. Are you fighting a war whose cause has already been lost? Are you ignoring the reports you are hearing, or your consciensce, because it is "easier" to do so or you are sure you are on the most profitable track? Are you living a good life but ignoring the Lord's will for your life? Is your mission to serve Him? Maybe it is time to pack up your weapons and head into port. I know the Commander, He will set you free. I was having my time alone with the Lord this morning in a garden spot on the campus of Dallas Christian College where we are training our students to serve overseas. I was sitting at a table. After I had been there awhile, I was approached by a young chinese woman named Yu Xen. I met her briefly my first day here, as she works on the campus. She timidly came to my table and sat down. It was evident she wanted to talk. I had no idea how much impact our conversation would have on me. She moved here 10 months ago to go to school at DCC, as a missionary in her home country had graduated from there. She wanted to go to a Bible School in the USA, where she believed she would encounter many believers. To her suprise, after 10 months, she has no close friends. She heard missionaries were coming to the campus to train teams, and was desperate for fellowship. So desperate, that she would ignore any social customs from her own country and approach me. She is a precious believer who understands what it means to deny herself, take up her cross and follow Christ. She comes out of the underground church in China. She expected the "land of the free and the home of the brave" to be filled with many believers who loved and worshipped God from a similar position of desperation. To her surprise, the churches she has attended have not been anything like she expected. There's been a lack of depth, and little fellowship that was meaningful. She grew up with an understanding of Salvation and of a relationship with Christ that was the most important thing in her life. Many of her countrymen have suffered immensely at the hand of their government for their belief. She was just sure that here, where worship could happen freely, she would encounter many who were seeking the Lord as hard as she was. I cannot speak to what churches she has visited, or what lengths she has gone to to try to establish relationships, but my heart breaks for her! She joined us for some of our sessions of worship and teaching. There are many wonderful churches in the Dallas area, without a doubt! But what does it say about the state of Christianity in our country that a sister from a persecuted church from Asia, would struggle to find even a friend, let alone a body who seeks after the Lord the way her heart burns for Him. We have much to learn about our relationship with Christ. I wanted so much to just embrace her and apologize for the shallowness of Christians in my country. She sees the lack of surrender in our eyes, and knows it has been replaced largely by the want for things, and a hard pursuit of the same. Believers who have suffered and lost loved ones for believing, have a depth of trust in Christ that most of us cannot relate to. It widens the culture gap between the USA and most closed countries. Watching Yu Xen worship, blessed me beyond belief. We must surrender our all, the entirety of who we are and what we possess to seek and serve our Savior. Too many of us have too tight a grip on the world to even realize that what we are doing is defaming the Glory of God! He is worth our total surrender. When are we really gonna finally do it? I arrived home a couple of days ago to find a phone message from a fellow supporter of a man who had run for president several years ago. The message indicated that he was going to run again and gave some resources to check on his support, endorsements and other information. It was even a real voice, not a recording! I wanted to be excited but the reality that his presence is (I'm sure) to be a part of the national debate, not to win, quelched any excitement on my part. Of course, intelligent, rational discourse on the values and foundations of our country are welcome, but their bearers these days seem to be written off as intolerant kooks, or worse. I must admit that I have been the closest thing my family has to a "political junkie"
though my enthusiasm has waned considerably over the last 10 or 15 years. The current state of our political process, which really hasn't changed that much (as born out by a recent reading about the 1968 Presidential campaign), has become discouraging and tiresome. Our current presidential race with all of its historic significance has failed to spark any real hope in my heart as I see a once Christian nation slide further into darkness. It isn't that our candidates overtly desire that, it just seems to me that the bleeding has reached a near-terminal flow and the core beliefs of so many have been significantly humanized - losing their eternal focus. Recently in my small group from church one of our members raised the idea that it could be that we are entering a point in our history where the Lord will turn us over to our (collective) base instincts and give us the leaders that we have asked for - those who won't make us feel guilty about our un-Biblical ethics and values, one who will look first and foremost to humankind for the answers. Think of the many kings of Israel who turned their back on our God who made them, freed them and gave them many miraculous signs! I wonder if he is right on this. Of course, what I (we) can't lose sight of is that even after all of those lukewarm-to-evil kings, God our Father still loved (loves) his people, still holds a promise for them, for us. It is more evident now that HE is our hope and inspiration and it is only through seeking and serving Him that we find true meaning in our lives and hope for the future. The more the ungodly suppress our freedoms and values, the more real our Faith in Jesus Christ will become. The darker the world, the brighter the Light shines! So if you, like me, are worn out and discouraged by the political season and seemingly never-ending campaigning, don't let it turn your focus to the discouragement you feel or the weariness that wants to overtake us. Be a part of the debate and let it make real to you the needs of those around you; let it give us greater purpose and motivate us to reach out to them and share with them the Light that can never be extinguished! P.S. Debbie, know that we are praying for your Dad and your family as he fights the medical issues that are overwhelming his body. What do you spend your disposable income on? For me, it is often books or for the last year or so, material costs for remodelling and home improvements. Don't think you have any disposable income? Are you sure? In 2007 we in the U.S. spent almost $17 billion dollars on bottled water. For most of us, it is because we simply prefer the taste of it. Few communities actually have dangerous water, so for most of us we simply choose to spend the extra money. How much extra? Depending on your taste buds, buying bottled water can cost from $400 to $1,000 a year per person if you drink anything close to the recommended daily intake. From the tap the same amount of water would cost you about 51 cents a year! Ok, so you drink water rather than purchasing soda or other options...still a choice isn't it? How many other things are we spending money on that could be limited if we weren't caught up in the easy-spending ways of our culture? Fewer watts in our new stereo (it's the same music and they don't need to hear it 2 blocks away), a smaller screen on the tv (is the whole neighborhood watching through your window? ), a less luxurious car (maybe a practical choice, not a "look at me" choice) -- does your 2 year old really need a cell phone?. The fact of the matter is that many of us complain about our economics without really looking at how well off we really are,it is easy to do until you spend time in a culture that has much less. As thousands of summer and full-time missionaries prepare to set out to serve here and all over the world, maybe we should re-examine how we are spending our money if we think that we have nothing that we can contribute to the cause. It is sad that one may not be able to go where they feel called because they can't afford to go. Why not pray that the Lord lay on your heart both where you can save and how He would like to see those savings used? For me, I just need to imagine that my well water is a new flavor of Fruit 2-O. Pray for focus and unity of the teams as they learn the drama and dig in the Word for wisdom and application of practical truths. Pray for the leadership that they may exemplify sound judgment and provide godly guidance for the teams. Pray for protection of safe passage and movement through the different countries getting to and from and while they are in the country. As the teams face the challenges of different cultures, attitudes and languages, pray that they may always be mindful of what they communicate with their actions and in all they do, regardless of the use of words. Thank you for your prayers during this intense time of ministry! Many churches are having Vacation Bible Schools and Youth Camps and different outreach activities here at home that we must also be in prayer for. May we each do our part in spreading the truth of Christ to our community! Very soon, I will be back in their land. I am excited!!! Today is my last day in the office. Monday we receive our leaders for the summer and train them for their respective roles. Enthusiasm is growing. We spend next week in training and then leave Friday morning early, for Dallas to receive and train the rest of our teams. We actually fly to our summer destinations on Tuesday and Wednesday, June 24th and 25th. We will return to the USA on July 23rd. Much has gone into the preparations for this year. We have seen the enemy ramp up attacks. This is not a surprise. Our Father God remains in control, and we do rest in that. Some of our students have struggled more this year to raise support than I have seen in the past. Again, He is still in control, and we are believing in His provision. One of you brought significant joy to our offices and to the hearts of three students yesterday! A dear woman from the northeast, sent a large check that has had a great impact on two young ladies and one young man! Your gift is making provision for students heading to Chile and North Africa! Thank you so much! It was such a surprise and blessing to hear from you! I am returning to Peru with 22 this year. I will be without my precious wife and partner this time. We made plans for her to be home to assist one of our daughters this summer. I will miss her a great deal. This is a long time to be apart. It is my hope that Deanna and Brad will write here from time to time. I know you enjoy hearing from them, and they do have signficant insights from their own lives! Lauren is doing well in her work, but it will not allow her to return to the overseas mission field this summer. She will, however, remain engaged in this one. Whitney is off from nursing school for the summer and is working as a nurse in an animal hospital in Denton, Texas. Two young ladies were on both of BJ's Peru teams. They are both on this Peru team this summer and are serving as leaders. I am very excited to be serving with them. We will be in Huaraz, Huamachuco, Pacasmayo, Trujillo, and a few other places this summer. The first two are mountain top villages, and I am very excited to be there. They are new places for me. I cannot wait to see how the Lord uses this team! They have set the pace for all of our teams in the responsibilities of getting their paperwork and funds in. The interesting thing is that they are the youngest team we are sending out this summer! One of the young men that poured into BJ his first year with Awe Star is on a solo journey in Peru right now. He is a gifted photographer and is trekking many of the high mountains for three months over his summer break. We will meet up with him during our time there, and he will likely assist us in translating for a few days. We also are sending a team to Chile that will work in Ovalle and Santiago. Another team will be in North Africa (not the same country we served in two summers ago) and will have many opportunities to share the Gospel in the land of Ishmael's descendants. Our final 30 day team will be in South Asia, also in a strongly non-Christian environment. When we return from these countries we will train and send out our final summer team to Panama. They will be there for 10 days. 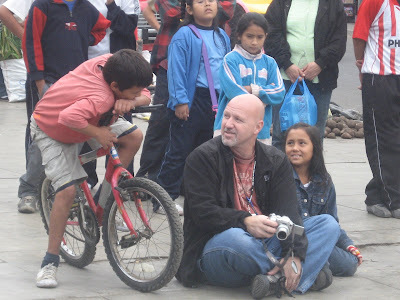 While I am in Peru, I also have two additional 10 day teams heading to Peru and Panama to serve for shorter periods. They are both church groups from Oklahoma and Missouri. Please pray for these teams this summer. We really need your prayer support and encouragement more than anything else! You can follow these trips through updates at www.awestar.org. Click on "Trip Updates," and then go to the country update of your choice. Those of you who have followed us in the past will find a different look. You will be able to post comments this year as we have moved to a blogger format. Feel free to leave comments anytime you wish! The pictures will be present here for you to look through as well. God Bless each of you! I pray you have a wonderful summer filled with Divine opportunities to share Jesus with those you encounter! Walk in faithfulness and obedience, and bring Glory to Him! I will be in touch from time to time through my family. I love and appreciate each of you for the significant support you have provided. 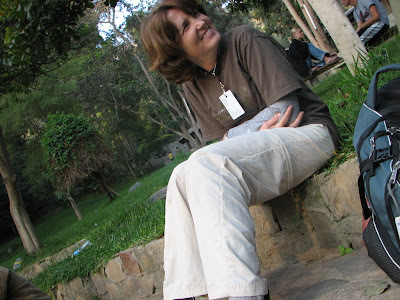 Deanna, outside of Trujillo, Peru. This past weekend, Deanna and I finally bought a new lawn mower. The one I had been using came from a friend who was called overseas, to serve in a full time capacity, on the mission field in Asia. This mower did the job for us, at least for a time. I am afraid I am a bit snobbish about mowers. I like them simple and inexpensive. I tend to look for the factory refurbished ones that did not work out for someone else. I am not a fan of the ones that cost great sums of money and then spend most of their time in the shop waiting to be fixed. When I was growing up, mowing was one of my sources of income. I used all kinds of mowers. I learned that I don't like "self-propelled" mowers. They are way heavy! That self propelled thing got me into trouble on more than one occasion. They seemed to want to take off for places unknown, and my job was to try to keep it corralled in the yard I was mowing. They didn't discriminate back then. Today, you can turn that mechanism off if you need to...at least on some of them. Back then, if the mower ran, so did the wheels, and they liked to cut up anything in their path! Non-discriminating mowers are a bad idea. I don't think I will tell you what kinds of things I shredded, but please know, it usually wasn't intentional! When my friend was preparing to move, and I needed a mower, the deal seemed right...except that the mower was "self-propelled." I am a bit older than I was back when I struggled to stay in charge of angry, never stop moving forward, grass cutters. I decided that I would be okay. Well, like most mowers I have had that were more expensive, soon that self-driving function, ceased. Do you know how heavy those things are to push if they aren't self-propelled? That specific aspect of technology must weigh in at...well, lets just say gastric bypass is in order. Soon, other issues began to happen. Piece by piece, it just started to fall apart. Most every time I used it, I had to nurse it to run, or reattach some new piece that fell off. Since Deanna is not going with me to Peru this summer, I decided I better not leave her with a mower that needed intensive care. Last night I put the new one together and went out to mow. It fired up with the first pull! This new mower is so light I can hardly believe it. I had forgotten just how much weight the whole self-propelled thing added, until now! For me, there is no comparison! This lighter weight, easier to start, less expensive yard machine was the way to go. I hope Deanna agrees! Way too often in our country, we seem to think the more money we spend on something the better it will work. This is often not true. Many tend to look at Salvation that way as well. Since we are a rewards based society, we tend to think we must pay out significantly if we are to receive Salvation. Frequently, people try to add things to what it takes to be saved. It stands to reason that we don't get something for nothing, they think. Salvation did come at great cost...just not to us. It did not cost us our physical lives. It cost Christ His. He gave His all that we might live, and be free from guilt and sin. His Salvation is a gift, an extension of grace to those of us who need it. We cannot earn it, and we cannot pay for it. It is ours by simply asking Him to be our Lord and Savior. Many try to buy their way into heaven by works or by doing good. These will fall woefully short. His Word teaches us that our righteousness (or good works) is like filthy rags. He came that we might have His righteousness, and with Him alone, our lives change, and the fruit born comes as a result of who He is (if we allow Him to use us). The works and good deeds become an outpouring of His love through us. In this way we accept no glory for what He does. We reflect it back to Him. Many are walking a "self-propelled," heavy life and they are weary and looking for a way to unload the baggage. We need to let people know. Mockingbirds and roosters set out to proclaim the break of morning. I have noticed however, that they begin before the dawn has awakened. How is it then that we say they are announcers of the day? Why do they get this acclaim if they do not do it well? If they begin early, how does that improve their disposition? What good is it to us? Perhaps their fame has falsely arisen. Perhaps we misinterpreted the circumstances. Was it one day that the first shaft of light had broken, that one awaking from their slumber heard such a proclamation and began the rumor of who was responsible? These who seem to have much to crow about do go on so. Sometimes sleep cannot be your acquaintance because of all they have to say. I believe the loud voices from the aviary were never meant to tell of the first glimmer of light. I believe they are simply doing what they were created to do. They do it very well. We in our fullness of self, assign meaning and designate falsely who they are trying to be. We have missed it again. How often do those around us carry on in their giftedness, and we through a jealous lens and our own broken dreams, cast shards of glass and blisterous barbs their direction for having the audacity to be good at what they do? Sometimes a mockingbird is doing nothing more than expressing the full extent of his vocabulary. He has much to say. We arbitrarily assign a name and blame for his speaking ill of others. Our view is not always accurate. Sometimes, a rooster crows because he knows the rocks will cry out if he does not. His desire is not to proclaim that morning has broken, rather that his Creator is worthy of praise at all times, day or night...and that we should begin to clue in to what we were created to do. Many of us will simply roll over, pull the pillow over our heads and try to return to the land of nod. Our concluding arguments will be about our intended hopes of peril for the one who continues doing what he was created to do...and we will accomplish nothing for Him who created us. In front of our book on the shelf...the first time Deanna got to see one of our own in a bookstore! Years ago I was an avid bicyclist. I have spoken of this before. I was most dedicated to the sport and would spend hours each week training and preparing my body to be able to handle the difficulties that could come. Now granted, most of the difficulties came at one's own desire. You had to choose to take on the long rides, or hilly courses, or competetive natures of other riders. To me, these were all givens, and I wanted to be the best I could. I usually rode for an hour and a half per night, three times a week and then did longer rides on the weekends. This was not leisure riding. I was pushing myself. There was a measured threshold under which I would not allow myself to drop below. If I did, I climbed out of the saddle and began to push. I learned much in those years. I learned how to stay in a relaxed posture in tense and tiring situations. This would prevent me from cramping. I learned to drink before I was thirsty. If I waited until thirst came over me, I was already dehydrating. I learned how to ride at high speeds a couple of inches off of the wheel of the person in front of me. This cut down on my own physical exertion by around 25-30 percent. I learned to jump over potholes at speed. I learned to climb the most difficult of hills or mountains by using good technique, being mentally strong, and being fit. Through the years, I saw many fail at this last point. I loved to climb. Because of this, I would enter group rides where climbing significant hills or mountains was the goal. It became rather easy to tell those who really invested in the sport and prepared themselves physically, and those who thought it would be fun to do and showed up with little training. One of the key indicators of this latter group occurred on difficult climbs, or after long miles on less difficult ascensions. Regardless, the result was what we called "lactic acid leg lock." A rider would be doing their best to get to the top, when all of a sudden, their legs would quit working, and they would simply fall over on the side of the road. I don't know the appropriate medical way to explain what happens, but it has to do with not getting enough oxygen to the muscles. Over time and exhertion without adequate training, these riders who tried to push themselves in these moments would accumulate lactic acid in their muscles, and when the ratio eclipsed a specific point and there was not enough oxygen, the muscles would lock into place, rendering the person incapable of their use...until it dissipated! When this happened, the rider would be overcome by surprise, as their leg muscles were suddenly and momentarily paralyzed and they would simply fall over. The muscles would rebound after a few moments of forced inactivity. I saw this scare many riders through the years. It was accompanied, as you can imagine, by pain. Today, I am seeing a vaguely similar issue. On a fairly regular basis, I see believers blame the "Lord's will," for the outcome of their own poor choices. Our Father gets the credit for many things were not of His volition or doing. Many of us have learned to use the phrase "God's will," in conversation with others. Too ofen we use it to reflect an outcome that was contrary to what we desired. There are certainly times when the Lord's plan is different than our own. There are times when the outcome is contrary to what we may have chosen. But, what we must be more cautious about, is failing to do the work before us, which we have been called to, and then assiging blame for the outcome on our Heavenly Father, when the reality is that we were lazy, and did not get to see the fulfillment of our calling, because of it. When we are called to do what the Lord wants, He does not change His mind mid stream. His calling is secure. Our role is obedience. Sometimes that means we have to do more work than we may be comfortable with, in order to see what He desires come to pass. Frequently, these days, it has become commonplace for us to superimpose our own agenda over a calling we have been given. When the two conflict, we do our own thing rather than that which we have been called to (because we want to and because it is usually easier). Along the way, we tell others that it was "God's will" that we not get to do or be involved in something that five minutes ago, we told them He had called us to. God gets the black eye and we skate unscathed. It's time to stop this foolishness. We need to get out of the saddle and push. God's will is seldom a thing that short sprints will achieve. We are in this for the long haul. Our time and training need to reflect the same. We cannot quit because things get uncomfortable. A friend of mine frequently says, "there is no testimony without a test." Too many of us quit when the test begins. Training is a long process that prepares us for greater things. We need to approach our relationship with Christ with preparation and willingness to train for long periods. Then, when the tests come, we are ready, and we have the privilege of bringing Him Glory! No other agenda matters when God's Glory is at stake! 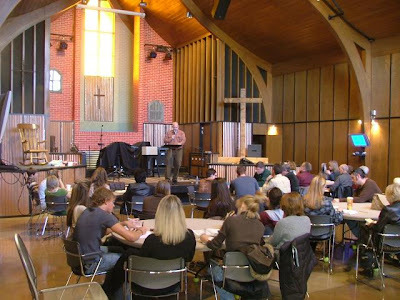 Teaching a seminar in my church's "old chapel." Saturday of this past weekend was spent cutting up the 45' Cypress tree (top) that fell during a storm while Deanna and I were in Indiana. I was so thankful that a couple of friends came to assist me. I could not have done it without their help. I mean, I could have done it, but not with the precision that it needed to be completed with. The tree top that dropped, landed in a precarious position. It was perched and resting atop our privacy fence. Once a couple of eight foot sections of fence were removed, it was poised to fall directly on our neighborhoods phone box main. I was pretty concerned about being the reason our area lost phone service. My friend Skip and his daughter Geri came to help. They came loaded with rope and other tools that would ease the mornings difficulties. Skip and his family also happen to be missionaries to Peru. They go every year and lead their church group. Skip's wife Carol began working in our office a few months ago. What a blessing she is! Anyway, Skip is wiser than I in the ways of being an "Ax Man." He took some stout rope and tied off the massive base of the treetop. The only issue I had was that he was planning to be the weight that would prevent the tree from falling where we did not want it to go. He set his body and I began to saw in predetermined sections that were stabilizing the tree in it's position. Each cut seemed to bring about the expected conclusion. I am afraid what would have happened if he had not been there to direct this symphony. At the very least it would have been out of tune. The noise of the saw idling was too loud for conversation in between. I would point where I thought I should cut next and he would nod yes or no. I don't know how often he had to redirect me, but I felt a bit like a little boy asking daddy for permission. I have handled a chain saw for many years. Doing precision work has not been my area of involvement. I generally left that to people who knew what they were doing. Having Skip there to help me make decisions was wonderful. Somehow, it took the pressure off of feeling like I had to make critical decisions that might end up costing significantly more than I wanted to pay. We felled the tree without incident. Whatever the issue, having someone direct the flow of activity who knows what they are doing brings such peace to the team. This is certainly true of life in Christ. It is true in our churches and other venues, where discerning His direction and will can sometimes be a daunting task. Godly leaders are so important. Without their leadership, it is a bit like a room full of energy with no particular outlet, and when a door opens, it explodes out with no channel of expectation or measure of effectiveness. Throwing raw energy at any task does not guarantee it's completion. Having key people oversee and direct the flow of energy is important. One can usually tell rather quickly when the wrong person was posted at the helm. One can also tell when the right person was selected. While cutting, and hauling the limbs and debris, we became covered with Cypress sap. Cypress sap is a bit like superglue. It adheres you to whatever you come into contact with, and it does so instantly. By the end of the day, we had brown splotches all over our clothes and exposed areas of skin. It wasn't very interested in coming off later during a shower. Sin in our lives is very similar. How quickly and almost inadvertently at times we come in contact with things not pleasing to the Lord. We get filthy with it, and then struggle to unload its vile stench. It's presence in our lives also seems to draw other things that we were not interested in, to our presence. We find ourselves 'stuck' where we don't want to be. Fortunately, we serve a God of grace who loves and forgives. He bathes us anew when we stumble, and we are washed clean. Seemingly, it happens a bit easier than getting Cypress sap off of your person. God may be raising you up, training you up to be in a position of leadership. Don't doubt yourself, if He is leading. He is preparing you for things He can accomplish through you. It's about His doing a work, and you being obedient. Your obedience can mean anothers Salvation. Go where He leads, and allow Him to direct. You will be blessed! There is so much that we must trust the Lord for in life. Sometimes I wonder how much we really believe He will come through. In two weeks, all of our leaders will make a journey from Tulsa (where they will be trained) to Dallas where Awe Star University will begin. Awe Star University is the training week for our missionaries, before heading off to the field. Up to this point, the missionaries have been busy trying to raise support for their trips. They really have to work hard to do so. This year has been more difficult with the economy and fuel prices surging in opposite directions. People are less inclined to give. As I review the finances of many of our students, my level of concern for how many of them will be forced out due to lack of money, increases. I have seen the Lord come through in the past. I have seen students who were ready to back out because they had worked very hard and just could not get the last $1000 dollars raised. Then just as they their discouragement was peaking, the Lord would bless them with someone who had just the amount of money they needed, and it often arrives anonymously! These stories are so incredible to see unfold! This year, it has been a bit harder to believe things would work out. Many of them have raised the necessary funds and are all set. There are, however, many who I look at where they are and it is hard for me to believe they are going to make it. So little time is left. Over the last couple of years, the battle we fought was a dropout rate of 15%. This year, that number has decreased, but so has the seeming ability to raise funds. The bottom line is I know the Lord was in control then just as He is now. Most of these students will make it, and their funds will come in. We serve a God who wants us to trust Him. It is so easy to do when things are going well, but when they are not, we tend to try to seize control. Control needs to be yeilded to Him all of the time. I know this, so why do I still struggle with the action of giving up my will and need to oversee things to assure they turn out right? My solutions would more often than not, interfere with God's answers. I need to do my job, pray, and allow the Lord to reveal Himself in the seeming impossibilities of life. This is when people get dearly blessed! It won't be long before I return to Peru with a team of 22. I also have teams going to Chile, Panama, North Africa and South Asia. The tasks before us are God sized. We must each trust Him for the solutions. Each of us have to be faithful in the trenches and then we can see His glory unfold. Not because of our work, but because of His plan. Many lives will be changed this summer. I cannot believe the time is nearly here, again. Praise God for His provision, and brent?...stay out of the way! Deanna's friends and fellow teachers from Zionsville, Indiana, Cathy and Stacy. Behind them are my cousin Paula and Brad. Deanna and I returned to Highland Lakes on our trip through the midwest. We got to see many old friends and it was wonderful. I really miss that place. When we drove in, my hopes were elevated when twice I saw the trucks of friends I did not expect to be there, and did think I would see. The feelings that rushed through me were exhilarating! I could not wait to see them. When we entered, I learned that in both cases, the pick-ups had been donated to the camp. Neither man was really present. I was disappointed not to be able to see them. Being at the camp brought with it many wonderful memories. I have never left a job behind that I found myself missing. This place is different. A very important part of me resides there...whether physically or only in the echo of my thoughts. Being there gave me many memories that were warm and some that were difficult. The foundation of significant growth happened there, and it means a great deal to me. Consistently, He has told me my time there was to be a time of rest. I have heard from many people recently, who have had dreams and were trying to interpret them. I know the Lord still speaks to us through dreams. He has done so in my own life. What I see people doing is trying to make literal interpretations from the physical memories of what occurred in them. I am no Daniel. I have no significant dream interpreting skills. So why the Lord keeps bringing these people to me I do not completely understand. I just know that when it comes to understanding them, we need to be careful. Dreams are often signposts in our lives that help mark out a way. Sometimes they provide direction, sometimes affirmation, and yes, sometimes warning. They are not all from the Lord. We must be discerning. It is important not to expect what we see happen in dreams to come to pass in a literal sense. My dreams have often been designed to help point me in a direction, not to be realities that played out verbatim. I realize that when we think of dreams or even discuss them, it is a gray area for most of us. It is not my intent to be weird or dealing with psychic kinds of issues. Clearly, God spoke through dreams in His word. He still does so today. It is just important for us to realize that because something happened in a dream doesn't make it true. I remember weird dreams that I have had that never ended up having any bearing on anything. I believe when we have dreams the Lord is trying to use in our lives, He also sends His Holy Spirit to help affirm to us that He is at work and we need to realize it. At least this has been true in my own life. When He is not present in or through them, they are of little consequence. Seldom are they literal. Usually, they have been guideposts designed to gain my attention, and to keep me moving in a specific direction. Again, that is only true for the ones that I know He has been at work in. It is important to realize the difference. I have seen the Lord use dreams in the last two or three months in the lives of people more than any other collective time. Perhaps that is only because I am more aware of it now, or maybe I am specifically being surrounded for His purposes that are yet to be revealed. What I do know is that I see people drawing literal conclusions to dreams that seem more likely to be guidance oriented. This concerns me as I know most of us are inexperienced with dreams and their interpretations. Dreams do not always mean what we think they mean. Just like signs can be misinterpreted, so can dreams. Seeing the trucks of my friends led me to believe they were present. They were not. I drew natural conclusions from the sign of their trucks being present. They both proved false. Both men loved the camp, but loved the Lord more. He moved in both of their hearts to donate their vehicles to a place that really needed them. The blessing of their obedience, continues to help the camp function. We need to be careful in this area. Not necessarily should we discount dreams, we just need to be cautious and wise in discerning their meanings. His eye is on the sparrow, and His eye is on you and me. 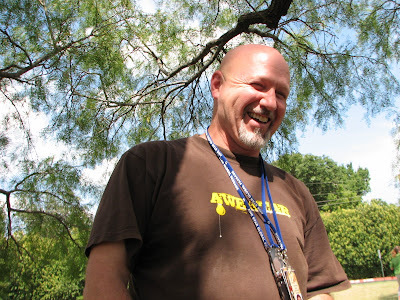 He has provided for each, and for Highland Lakes. He continues to make available to every one of us, that which we need to continue on. If we keep Him on the throne and He is more important in our lives than dreams or other peripheral markers, He will show us the way. His Word is full of unexplored trails! 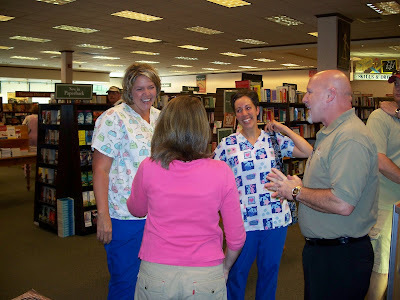 Donna and Diana, two of BJ's nurses, suprised us at our book signing at Barnes and Noble (Donna wrote the prologue in our book). We arrived home safely late yesterday afternoon. Our return trip from Ohio took just under 12 hours. Thank you for your prayer support. Monday night was such a blessing. Mark and Tammy McMahan had set up a speaking opportunity for us in Wilmington, Ohio. It just so happened that Marti Pieper and some of her family were in the area visiting her parents at the time. We were afforded the privilege of a sweet time of fellowship with them. We all met through this website, so it was quite a blessing to finally put faces with names. Of course we had already met the Piepers, but for all of us to be together in one place was wonderful! As I continue to reflect back on all that has happened in the last week and a half, I am amazed and thankful. I can hardly believe how much was packed into this trip. We got to see so many friends and family in a short period of time. There are so many highlights. Encouragement came from so many different people, both those we knew and many we met for the first time. What a privilege we have been afforded. When Deanna and I arrived at Barnes and Noble for the book signing, we were pretty apprehensive. We really did not know what to expect. We were amazed to see many people come out. From the photo above, you see Donna and Diana. This was such a treat for us. I tried to figure out a way to fit in a hospital visit (which I was unsuccessful at) and we were so excited when these two ladies walked in. It was so meaningful to us that they would take the time to come and visit us! Donna was even requested to sign a book since she had written the prologue! How cool! Our first visitors that day were from a couple. They came to buy books for some of the hospital staff! She worked in a different area of the hospital (the NICU), and knew about BJ. She came to get books for one of our doctors and two of our nurses. She also got one for each of her children. Over and over we saw people buy multiple copies to be read in the same family. Each wanting their own copy. I am amazed by that! I know that does not happen very often in most homes. We usually pass books around. Our TV interview was very interesting! Our friend Angela Ganote, the Fox 59 morning co-anchor (who we got to know through our journey) had us return for a follow-up of the two previous stories she had done on our situation. Since the book was out, she was interested in kind of bringing the story full circle. Unexpectedly, as we were being counted in for live tv, Angela was overcome with emotion! She handled it professionally, and all went well. I know going in, we thought we might get emotional, so it was quite a turn for us when we were not the ones to do so. She is such a blessing to us! Deanna and I agree that she is more beautiful than your tv screen allows you to realize. Her heart is amazing. She loves the Lord and it is evident. Whether it was late night eucher with new friends, sharing a holiday with my mom and family, catching up with old friends, or being chased to our car by a raging storm, we had an incredible time. Speaking in the three different venues was signficant as well. We met many wonderful people, and got to fellowship with them. We praise the Lord for His provision of this trip! What a blessing! Mark, I am so glad that you are still with us! I am sorry for what you went through! It sounds very difficult. I understand the feelings you reflected upon in those moments, and appreciate you sharing them. God Bless you, man! We got home to find that a storm had brought a significant portion of our largest tree down. It did not hit the house or any of the neighbors, so we are thankful. It is resting mostly in a neighbors yard waiting for our attention. It has been an amazing week and a half! We have covered so much territory and God has been sooo good to us! We have been afforded the privilege of reconnecting with many precious ones! In the picture above, we had lunch with the Kotesky's right before our book signing. It was so good to see them again! I sit here in Ohio right now, before our final engagement of this trip. 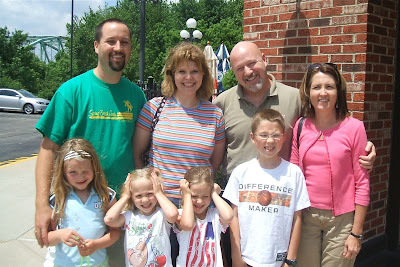 Many of you know of the McMahan family that have blogged as "On our knees." Well Deanna and I have been fortunate enough to spend a couple of days with them here in Ohio before we head back to Oklahoma. They have set up an event in Wilmington that many have been invited to. Promo's have played on the radio in Dayton, Columbus and Cincinnati. We are unsure what to expect, but are excited to see what the Lord brings! Yesterday at our home church - Northside, was incredible. Deanna sang and I got to share and it was amazing. We saw so many old friends and made many new ones. We were greatly blessed to sell many books as well. At our book signing, we sold out of books that the store had purchased. They ordered several more while we were there, and we signed cards that will be affixed inside the front cover. We met many new people and got to see some family we had not seen in a very long time. The surprise of the day was that two of our nurses from St V's showed up! They came as a a result of seeing the tv interview. We were so incredibly excited to see them!!! It has been such a blessed time. We are tired and a bit uneasy thinking about the long trip home. The fellowship has been so sweet, and the presence of the Lord has been with us so significantly. We thank you all for your prayer support. God bless each of you, and we hope to write regularly again beginning on Wednesday or Thursday.